We have been involved in the Rottweiler breed for 31 years and have bred/owned over 80 Australian Champions and just this year our nine month old puppy “Oscar” won back to back Best in shows which gave Khingsahl Rottweilers their 100thBest in show. 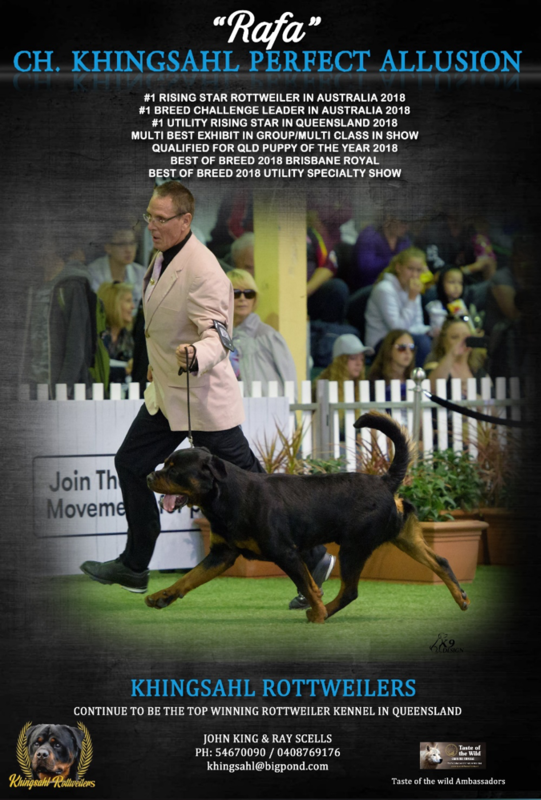 We started using Taste Of The Wild in May 2017 and by December 2017 our boy “Flash” won another 15 Best In Show Awards to finish the year as the number one Rottweiler in Australia and the number one Utility Dog in Queensland and became a Supreme Champion. Not only has Flash excelled on Taste of the wild but all our show dogs that are on Taste of the wild have had outstanding results with Flash’s Grandson “Rafa” not only gaining his Australian Championship he is also the number one Rising Star Rottweiler in Australia and the current number one Rising Star Utility dog in Queensland. Although retired from the show ring our Nine year old Patrick who is the most awarded Rottweiler in the All Breeds ring in Australia with 38 Best in shows, has been on Taste of the wild for the last 12 months and we have never seen him in better condition than what he is now. We thank Taste Of The Wild for all they have done for us and we look forward to sharing many more of big wins in the show ring with our dogs and it is all thanks to feeding our dogs on Taste Of The Wild. KHINGSAHL ROTTWEILERS ARE VERY PROUD TASTE OF THE WILD AMBASSADORS!